The sacred sign I know. The word ‘eastwest’ was not invented by the poet and the architect Andrei Voznesensky , but was saved by him from forgetfulness. This term was popular in the times of the disputes between Westernists and Slavophils and was discussed in the works of S. Bulgakov, E. Trubetskoy, N. Berdyaev etc. In those times (about one hundred years ago), however, ‘East’ mostly meant the Muslim world. For example, the famous poem by V. Khlebnikov “Children of the Otter” has plenty of references to Nizami’s poems. When speaking about relations between Eastern and Western cultures, we usually cite an even more famous ballad by Kipling: “Oh, East is East, and West is West, and never the twain shall meet”. Although Kipling describes a fight between two proud soldiers – an Englishman and an Afghan man. One hundred years ago it was very unlikely that, at the edge of the millennium, Japan, Korea and China would become the most dynamic cultures. 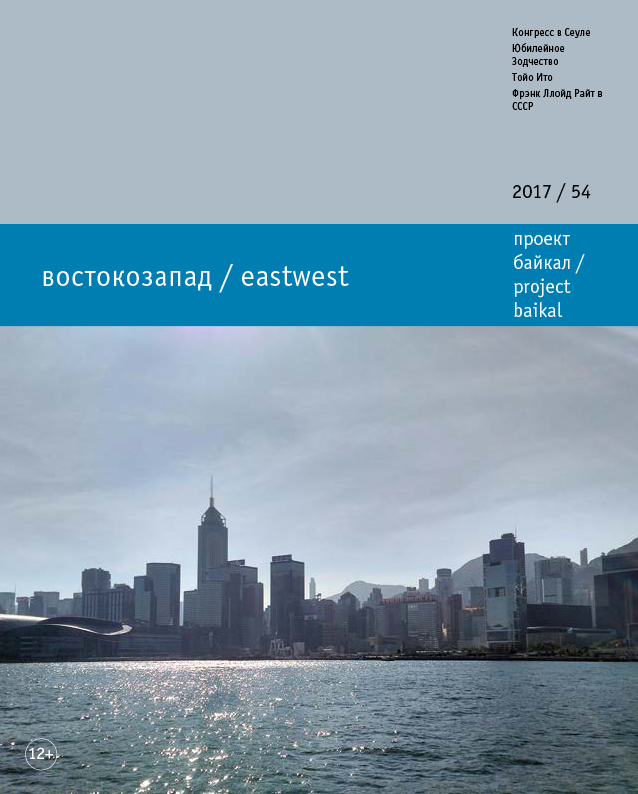 Ten years ago one of the issues of Project Baikal was devoted to the topic of NEIGHBOURS and concerned international relations in the field of architecture between Asia and Russia. A lot of things have happened since then. China (the world’s second largest economy after the USA by nominal GDP) is making rapid progress towards its goal – to become a superpower by 2050. In three years it is likely to reach its ‘first centennial goal’ set by Deng Xiaoping – it will have built a ‘moderately prosperous society’. (p.110), with the brightest names of the speakers and the brightest constructions built in the capital (pp.113-117). Now it is counting the days till the Winter Olympics (February 8, 2018). Japan has been a great economic power for a long time. It is the world’s third largest economy by nominal GDP. The average life expectancy of the Japanese population has reached record 84.6 years and is still growing. Hence Japanese architects are at the top of the world ranking. The Gold Medal awarded to Toyo Ito at the Seoul Congress is an illustrative example of that (p. 124). Architecture as a creative field actively responds to the cultural contacts. West is searching for a common language with the Muslim world, the Near East and finds it. It is time to come to an understanding with the Far East, the Buddhist, Shinto and Confucian worlds. GRIGORYEVA, Elena. eastwest. project baikal, Russian Federation, n. 54, p. 1-1, dec. 2017. ISSN 2309-3072. Available at: <http://www.projectbaikal.com/index.php/pb/article/view/1237>. Date accessed: 18 apr. 2019. doi: https://doi.org/10.7480/projectbaikal.54.1237.